I’ve been thinking a lot about our trip to New York City and how to tell you about it. We did a lot! I think, though, that I will start by telling you about my favorite thing: The Tenement Museum. This museum is definitely not a typical museum. There are several different tours you can take, each on various topics regarding life in the tenements of New York. The tour we took was called “Sweatshop Workers” and it involved visiting 3 different apartments in the building on Orchard Street, describing what life was like for the Levine family as they worked creating ladies dresses in their apartment, and discussing the challenges and obstacles they faced living in the most densely populated place in the world. Our tour guide was fantastic and the tour itself was interactive, engaging and enlightening. There are also several other tours, including ones on Shop Life, Hard Times, and Irish Immigrants. They even have walking tours of the neighborhood to partner with tours of the building and on Thursday evenings they have Tastings at the Tenement, an event that includes lots of flavors from the Lower East Side, both past and present. (Side note: I’m totally going back for that one!) There is a fabulous gift shop where we made several purchases, including, as I previously mentioned my awesome new hat. It’s easy to get to, reasonably priced, and I can’t recommend it enough to anyone visiting New York with even a mild interest in history, immigrants and the cultural melting pot. Let me end this post by saying that my preference, when I tell you about stuff, is to show you photos of the stuff. However, there is no photography allowed in the Tenement Museum so I don’t actually have any photos to show you. What I do have, though, are pictures of the lunch we had after visiting the museum. We were in the Lower East Side and had just spent an hour and a half talking about Jewish immigrants. Where else would we go but Katz’s Deli? And what else would be have but matzo ball soup and pastrami sandwiches? 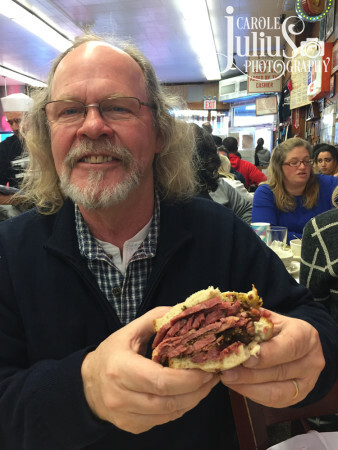 Truthfully, I could write a whole separate post about Katz’s and the awesome food and atmosphere, the super friendly couple we shared a table with, and the cultural significance of this deli – but I won’t. I will simply say: go. Carole, I just love reading your blog. It’s like a novel that I can’t ignore. I plan to visit the big ? In the near future and I will definitely visit the Tenement Museum when I do. About those deli’s. We took our girls to Carnegie Deli 20 years ago and we were flabbergasted when the gigantic portions arrived at our table! Live and learn right? I have to say that one of my favorite of the posted photos was Dale’s pigeon on the ledge of the Empire State Building. I’m craving pastrami now. That museum sounds so interesting. Where did you guys stay and would you recommend staying there? Have fun at spa! I would LOVE to visit that museum! It sounds just fascinating — in every way. (LOVE your hat, by the way.) That deli? Mmmmm. Icing on the cake. That sounds like a great adventure – you painted a great picture through your words. I keep hearing more & more about that museum. Last summer, we sat next to one of the co-founders of the museum (I believe that was how her husband introduced her in “what do you do” as he was talking with my sister) when we saw the “Oklahoma!” revival at Bard College & since then it seems high on the radar. I’ll definitely have to check it out! The Tenement Museum would be a must stop on any trip I took to NYC. It must be so interesting and give the feeling of being right there in the midst of their lives. You are the third person I know to recommend the Tenement Museum so I think I’ll have to go! I’m lucky enough to live relatively close, but getting there and getting around in the crowds can be overwhelming so I don’t go often. It looks like the Tenement Museum is worth making an effort for – thanks! I’ve never even heard of that museum but my goodness I would love to go. And that sandwich! If I didn’t already want to return to NYC, your description of the tenement museum has my feet itching. I have read so many books and seen so many movies about poor immigrants in New York and this museum would undoubtedly bring those pages alive. And the Jewish deli–we have a good one here and the food is to die for! Sounds like a fantastic museum! And, Katz – oh yes, the best pastrami! That sounds like an interesting museum. We will have to put it on our list for our next visit. 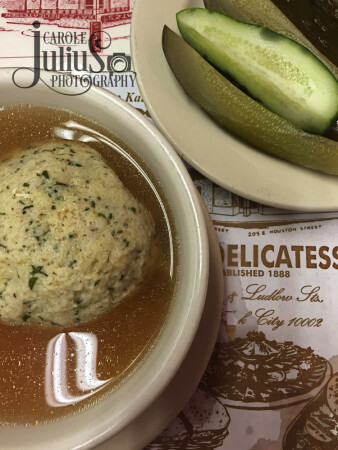 Matzoh Ball soup is my favorite – we make it often during the winter. And Katz’s Deli? There are no words. Thank you for the recommendations. Many trips to NYC and I’ve never visited that museum OR Katz’s. Larry’s grandparents owned a deli in the lower east side. They had some very interesting stories, especially some involving the mob. My daughter-in-law teaches at an elementary school on the East side, and she takes her 4th graders to the Tenement Museum every year. My husband and sons have been as well. Somehow I’ve missed it, but it is always on my list of things to do every time we visit NYC. Now I’ll add the deli to that list. I LOVE the Tenement Museum. I’ve been twice…but have done 3 tours. Check out their YouTube channel where they post recordings of author talks. That feeds my reading list, too! We went to Katz’s Deli after Elder Son’s medical school graduation ceremony. Perfect! Thanks for the info on the Tenement Museum. We will be in NYC in June and that sounds like a worthwhile stop. My husband and son are history buffs. I like exhibits that make you feel like you are there or a fly on the wall looking in. I have always wanted to go there, the tour sounds like the best way to do it. Thanks for the suggestion. Mmm, Katz’s. One time my husband missed his train back to PA because he went to go get me a sandwich before leaving the city. It was worth it though! 🙂 I think a visit to the Tenement Museum is just the excuse I need for a day trip up that way!